A recent scrutiny into the state of public health in Gujarat by a voluntary organisation, Sahaj, with the help of two dozen-odd activists and experts, has found that things are particulalry bad with regard to mental healthcare for the backward sections of society. Offering four case studies, it says, there is, in fact, "no public health system that deals with the issue of mental illnesses in the area which is particularly vulnerable because of extreme poverty, chronic health issues." 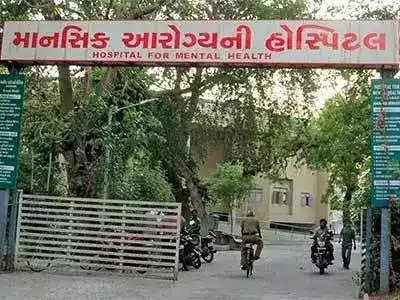 Suggesting that the Gujarat government infrastructure in the mental health sector is centred around major towns, the study says, it comprises four hospitals, one each in Ahmedabad (317 beds), Vadodara (300), Jamnagar (50) and Bhuj (16). Additionally, psychiatry departments of (government) teaching hospitals at Ahmedabad, Vadodara, Jamnagar, Surat, Rajkot and Bhavnagar provide additional 157 psychiatric beds. At the district level, however, things are bad: "Honorary psychiatrists visit district hospitals 2-3 days in a week, with a mental health worker who maintains records. Currently, such services are available in six of the twenty five districts: Bharuch, Panchmahals, Sabarkantha, Junagadh, Mehsana and Banaskantha." Offering four case studies from different areas of Maliya in Morbi district of Gujarat, the study, "Monitoring the Progress of Sustainable Development Goals in Gujarat: Situation Analysis for Selected Targets from SDG3 and SDG5" highlights difficulties in accessing these services. It says, people in "progressive" Gujarat do not have much knowledge about health services for mental health, forcing them to "approach the local ‘bapu’ or a traditional healer", who refers them to "private doctors in Gandhidham or Morbi." It continues, "Some people do approach the community health centre (CHC) in Maliya but the doctor himself says that they are not equipped to deal with mental health issues. He says that he usually refers the cases to Morbi or Rajkot Civil Hospitals. Hence, people in the community are forced to go to private doctors in nearby towns." The study notes, "When a person from this social and economic background approaches a private health service the financial burden on them is tremendous. Family incomes are not regular and the range for the expense on the treatment on mental illness is approximately Rs 2,000 to Rs 9,000, including travel to local towns. The situation forces them; they either borrow money or sell their land or sell their jewellery." Twenty four year old Farida lives in Zakariya village. He father died four months ago, her brother and mother keep very unwell as they are highly malnourished. There are unable to work on the salt pans, hence the mother and brother do stitching of bags for the storing of salt. They earn approximately Rs. 125 per day. The work is done for about 8 months in a year, the rest of the year, her brother works as a farm labourer and earns approximately Rs. 150 per day. According to Farida’s brother, she is unable to do any work as she is suffering from mental illness and regular medicines need to be given to her to control her fits. It is necessary that she takes medicines regularly as otherwise her fits make it impossible for her to even sit. She listens to no one and is uncontrollable and shouts and screams. The brother says that she was born like that but for many years she was never taken to any doctor as they were unaware of what should be done and no treatment was available. It was only recently that they took her to a ‘bapu’ in the block where it was suggested that Farida be taken to a hospital in Morbi. Her treatment in Maniar Hospital in Morbi costs approximately Rs 1,200 every month and it is impossible to get medicines every month as the income of the family is not enough for basic subsistence let alone bear the cost of her medicines for mental health. The family does have a Mukhyamantri Amrutam card, but the illness that Farida suffers from is not covered in any of the hospitals. Fifty-year-old Amnaben of Nava Hanjiyasar has three daughters who are married and stay in their marital homes. She and her husband live alone in their house. Her husband used to work in the salt pans until recently he had a kidney operation. At present there is no earning member in the family as the husband cannot. Her initial symptoms of mental illness started about seven years ago. According to her daughter, she initially got high fever and pain in the ear. She was taken to the Maliya CHC, but as there was no improvement in her health. Her daughter said that there are times when her mother runs away into the village in the middle of the night. Someone constantly has to be with her so that she does not run away, especially during the night. When she gets attacks she even tears the clothes that she is wearing. Amnaben was taken to private hospitals in Maliya and Morbi. The doctors informed the family that “magaz ki nas me khoon nahi mil raha” (the nerves in his brains are not getting blood). The family feels that it is due to the constant heat in the salt pans that has affected her nervous system. They then took her to various private hospitals in Rajkot, Gandhidham and Ahmedabad. At present she is being treated by a private hospital in Ahmedabad. Frequently people from the village go to the city to sell prawns and get the medicines for her from the city. The expenditure on Amnaben’s medicines and the treatment on an average is Rs. 60,000 per year. The family had initially borrowed money against the 12 bigha (3 acres) of land, which they have been unable to repay. Presently they have to depend on the money that Amnaben’s husband’s brother gives. And have to constantly keep borrowing from ‘saga sambandhis’ or relatives. Her daughter said that Amnaben’s health has been better since the past 6 months, the attacks have reduced but have not disappeared. Sixty-year-old Jakkhabhai lives with his wife and one son and one daughter in Nanavada village. He has 6 sons and 3 daughters. He cannot work, his wife and youngest son work. His wife has 4 buffaloes which give milk and she sells the milk, going door to door. On an average she earns Rs 200 in day. The son herds the buffaloes of neighbours and earns Rs 200 per day. Mumtazben, his wife, says that her husband has been mentally ill for almost 25 years. He does not even sleep and creates a ruckus in the house. At times he hits her and there have been instances when in his hysteria he has even tried to throttle her. In the night he leaves the home and goes around walking and at times banging on doors of neighbours. He talks to himself, randomly starts singing and abusing passersby. In the initial years he was taken to Maniar Hospital in Morbi by Mumtazben. Later he was taken to a private hospital in Gandhidham which is almost 100 km from Maliya. He was admitted in the hospital for about a week, and then his health improved and was brought back to his village. Since then he has been getting his treatment from Maniar Hospital. The medicines need to be administered every 15 to 20 days. The family tries to arrange money in whatever way they can as it becomes very difficult to handle Jakhabbhai if he does not get his medicines and has an attack. Last when they had gone to Maniar Hospital, they were advised to give him injections to control his fits. But the son was asked to sign a consent form saying that if something happens to his father then the hospital will not be held responsible. The son did not agree to the terms hence the doctor told him that he should go to Krishna Multi Speciality Hospital, but it would cost them at least Rs 500. The son did not have so much money, so he took his father back, buying only the medicines and not the injection. Six-year-old Krish lives with his mother, maternal grandparents and maternal uncle and aunt in Taragadhi village. His father left his mother, Savitaben when she was two months pregnant. Since then she lives with her parents. Krish studies in class one. He is accompanied by his grandmother to school and she stays with him the entire time. He needs to be helped with all the tasks as he is unable to do any task independently. His mother says that he gets hysteria, from the age of 7 months. From his birth he has been taken to various private hospitals in Morbi, Rajkot, Ahmedabad and Gandhidham. The doctors say that insufficient blood is reaching the brain and hence he has various mental issues. Krish has 50 percent mental retardation as per his disability certificate, and has to get his medicines continuously from various private hospitals. He also has cerebral palsy, which is 70 percent and leads to movement disability affecting his vision, swallowing and speaking. His symptoms are poor coordination, stiff muscles and tremors and frequent seizures. At present he is being treated in Krishna Hospital in Morbi. On an average his family has to spend Rs 8,000 a month on the medicines and travel for Krish’s treatment. Over the years they have spent around Rs. 3,00,000 on his treatment. Savitaben earns around Rs 3000 in a month by working in a local stationery shop. Her parents work on local farms as daily wage labourers and they on an average earn Rs 6000 in a month. She has not availed any scheme as she is not aware of them (MA, Viklang Sahay Yojana etc.). As Savitaben stays in her maternal home her name is not listed for any of the entitlements that she should be getting. She has to struggle hard to get the money. It is difficult for her to borrow from people as they are aware that her capacity to repay is very limited.